The Cabbagetown District, east of downtown Atlanta, originally consisted of the Fulton Bag and Cotton Mill and the housing built for the factory workers. The mill is a complex of buildings constructed primarily between 1881 and 1922. The main factory buildings are five-story brick buildings designed in a Neo-Romanesque style. Two of the three original mill buildings remain today. Founded by Jacob Elsas, the mill manufactured standard-sized cotton bags at a time when most of the cotton in the South was being shipped to the North to be processed. Because this area of Atlanta was sparsely populated in the late 19th century, the owners of the mill company decided to erect housing for its employees. 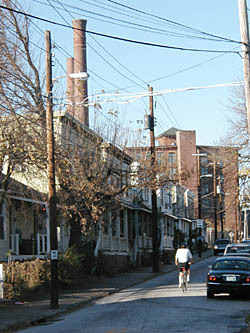 Housing along the streets was built at different times. The houses, situated on very small, narrow lots, vary in type from shotgun cottages to more sophisticated bungalows. Many of the houses have Victorian ornamentation that is mostly evident in their porches, doors, and windows. The first housing section, known as the "Factory Lot," was built around 1881 but is no longer extant. The oldest remaining houses were built between 1886 and 1892 along Reinhardt Street. Much of the housing was without plumbing and electricity until well into the 20th century. Hydrants located on back porches and the outhouses were replaced with indoor plumbing in the 1940s. Kerosene lamps and coal heaters were replaced in 1950 when the houses were wired for lights. A park known as "Noah's Ark" due to a nearby large, one-story apartment building provided recreational space for the community. There was also a baseball field in Cabbagetown, known as "Red Hill" because of the red clay of the field. The mill maintained the entire neighborhood and its lawns. It also provided garbage, security, medical, dental, library and nursery services for its employees. Only when the Elsas family sold the mill in 1957 did most of these services end. At the time the mill was sold, the residences were offered to their respective tenants. Those buildings not bought were sold in groups to non-residents. The mill itself was closed in 1977 and remained vacant until the mid-1990s when the complex was converted into loft apartments. Occasional commercial enterprises are found through the village, most of which are long-established family-run stores that serve the immediate community and its needs. 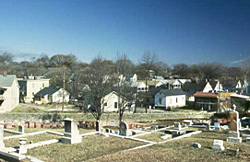 The Cabbagetown District is bounded by Oakland Cemetery, Boulevard and Pearl sts., Memorial Dr., and the Georgia Railroad tracks. The houses in the district are private residences and are not open to the public.